Tyson Foods on Tuesday became the latest chicken company to begin phasing out antibiotics amid concerns that they are overused and could be putting humans at risk. The poultry and meat company is working to eliminate human antibiotics from its chickens over the next two years, saying it wants to do its part to slow the rise of antibiotic-resistant infections in humans. "We don't have all the answers," said Christine Daugherty, head of sustainable food production at Tyson, in a statement. "But we want to make sure that antibiotics continue to work." The concern is that the use of antibiotics to treat sick chickens is making the medicine less effective in humans and contributing to the spread of drug-resistant bacteria. The food industry has been under pressure from consumers and public safety advocates to come up with an alternative ways to keep chickens healthy. David Plunkett, a food safety expert at the Center for Science in the Public Interest, welcomed the move but called for an outright ban on antibiotic use in agriculture. "These are antibiotics that we want to have effective for human health and not creating resistance," he said. "It's simply unsustainable for us to waste critically important antibiotics on things like growth promotion." Plunkett said poultry farmers have used antibiotics to help keep healthy chickens that are raised in crowded and unsanitary conditions. McDonald's (MCD) recently said it will only use chicken raised without certain types of antibiotics. Tyson supplies much of the chicken used in McNuggets. And Chipotle Mexican Grill (CMG) announced plans to remove all genetically modified ingredients in its food. 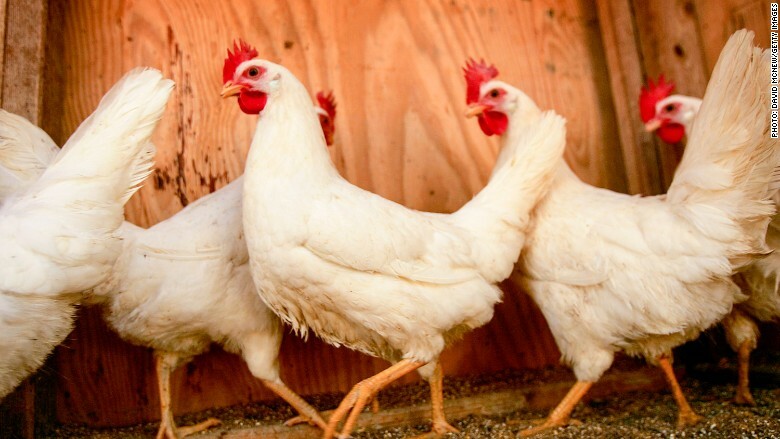 Other poultry producers have been taking steps to curb antibiotic use. Perdue Farms says 95% of its chickens are never given antibiotics, while Pilgrim's Pride (PPC) is also scaling back its use of the medicine. Tyson (TSN) has already begun reducing antibiotic use in its "broiler" chickens, which are raised for meat. Under the plans announced Tuesday, Tyson said it will phase out antibiotics in its chicken flock by 2017. The company also said it plans to work with its suppliers to reduce antibiotic use in cattle, hogs and turkeys. The Arkansas-based company is one of the largest producers of chicken, beef and pork products. It owns brand names such as Jimmy Dean, Hillshire Farms and Sara Lee. While it wants to move away from antibiotics, Tyson said it will continue to treat sick animals. The company is working with others in the industry to develop alternatives to antibiotics used on farms. "We will not let a sick animal suffer," said Donnie Smith, president and CEO of Tyson Foods. "We believe it's our responsibility to help drive action towards sustainable solutions to this challenge by working with our chicken, turkey, beef and pork supply chains."